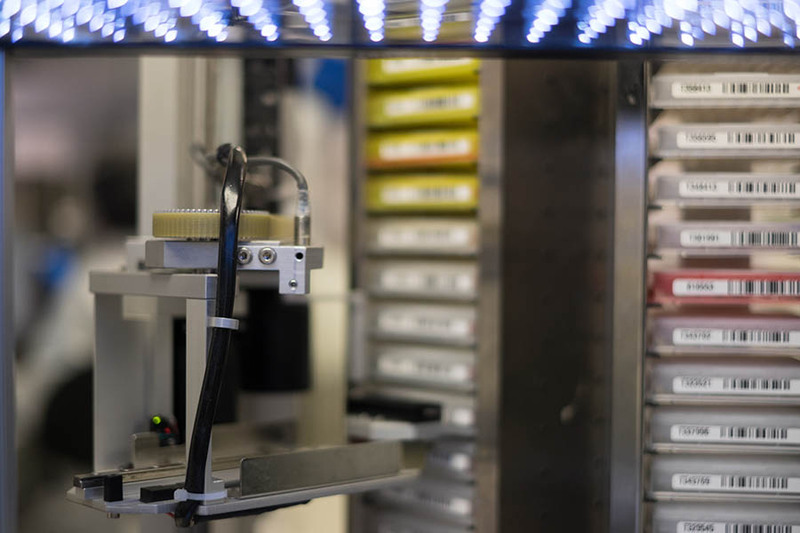 Robots pull well plates, containing hundreds of researcher’s samples, from towers. Tim Hodge and Bob Bean faced more than the standard challenges that most start-up companies encounter with the launch of a new business. Both men had left the security of their jobs in pharmaceutical sales in October 2000 and decided to follow an uncertain road to owning and operating their own business. Adding more pressure to the equation was the fact that they had to create a full engineering design within the six months funding they had secured from a venture capital group in Colorado. Further underscoring the urgency of their situation was the fact that the men’s wives were each expecting children to be born within that time frame. Hodge and Bean accepted those challenges, assured that their goal of answering a difficult question – “Why can’t we automate genotyping?” – was attainable. Genotyping is the process of determining differences in the genetic make-up of a living being by examining its DNA sequence using biological assays and comparing it to another individual›s sequence or a reference sequence. The procedure reveals the variant form of a given gene that the subject has inherited from its parents. Bean and Hodge felt that the key to their success would be in custom automation of genotyping to process samples using the company’s novel scientific method for genetic detection. They decided to headquarter their business and build their laboratory in Cordova, Tennessee, a suburb of Memphis. The river city was the logical choice for a location as the customers they hoped to attract were not only spread across the U.S., but around the world. With the world headquarters of FedEx in Memphis, genetic samples from around the globe could be brought to their lab, often overnight. The two partners had guessed correctly. Transnetyx survived its precarious infancy and, even though it took nearly ten years to convince local Memphis banks to replace private equity funding, eventually they agreed. The company launched the world’s first fully automated genotyping system for transgenic, knock-out, and knock-in mouse lines. Later, it added lines for zebrafish, rabbits, ferrets, goats, and rats. New customers were added monthly. The dream of Bob Bean and Tim Hodge has grown from its original home office in Cordova to include sales representatives around the U.S. and now in Europe and Australia. A recent 15,000- square foot expansion of its Cordova facility expanded the laboratory and allows staff to have greater throughput of samples for future growth. 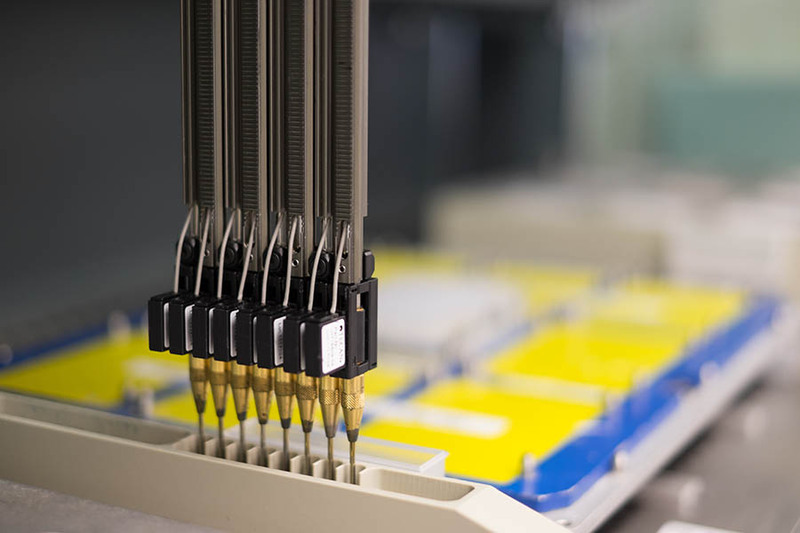 Transnetyx staff members take great pride in providing researchers in universities, hospitals, and bioscience companies worldwide with an automated genotyping service that delivers accurate results in an efficient manner. Accuracy of results is at 99.98 percent with on time results averaging 98 percent. About twenty percent of Transnetyx’s business comes from Europe, approximately ten percent from Australia, with the remainder from the United States. The overall goal is to accelerate biomedical research and save valuable time. Transnetyx seeks to replace the all-too-common human error found in manual labor processes with high throughput automation. This allows the company to return accurate, reliable results through the use of real-time PCR to its customers at a rapid pace. Even 24-hour results are available to Transnetyx customers. In 2008, the company added automated TAGCenters. This is Transnetyx’s version of a kiosk where customers place their order and ship the samples which are to be genotyped. It provides the existing customer with an extremely user-friendly experience, including step-by-step instructions as well as the capability to view tutorial videos on the machine. It also allows staff to track the order from the moment of placement all the way through to reception at the Transnetyx home office. Realizing that this automation would be useless without outstanding, service-focused people within the company, Transnetyx’s managers point to the amazing people onboard that facilitate the process. Transnetyx’s success has resulted in numerous accolades, among them being named 2009 Memphis Business Journal Small Business of the Year and the same magazine’s CEO of the Year in 2012. Equally important as their awards and accolades, Transnetyx managers and staff take great pleasure in contributing to the quality of life, not only in Memphis but through philanthropic initiatives across the U.S. and even abroad. In Memphis, the company supports a local charter school by educating students in science and technology; partnering with schools in career fairs and teacher appreciation lunches; sponsoring YMCA corporate games; and numerous other programs. Nationally, various donations are made to research centers and Homes for Animal Heroes. On the international stage, Transnetyx matches dollar for dollar all employee donations to Dreamland, an all-boys orphanage in India.